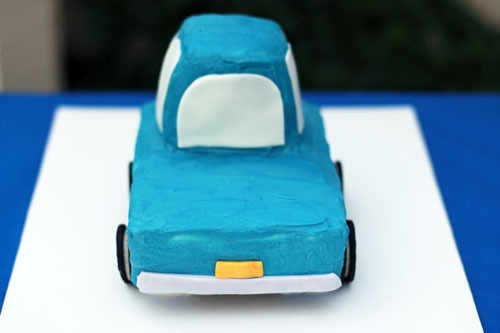 This Week for Dinner: Little Blue Truck Birthday Cake |Â This Week for Dinner - Weekly Meal Plans, Dinner Ideas, Recipes and More! I love making my kids’ birthday cakes. The tradition stems from my childhood. I remember so many of the cakes my mom made for me and I also remember being sooooo excited for each of those cakes. They made me feel special and like my mom could work magic. My brother and I have both continued the tradition with our own children. It’s one of those things that I really love to do for my kids. Each time I make a cake I share it on the blog (let’s be honest, I like to show them off! ), but I never get around to explaining how I put the shapes together. 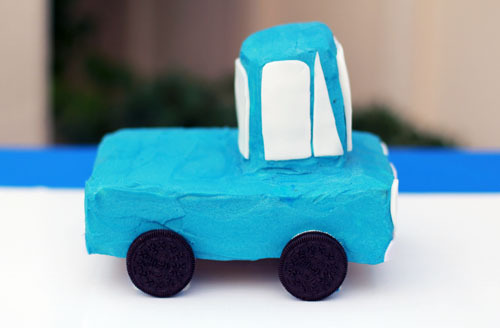 I thought I’d give a quick rundown of how I assembled the Little Blue Truck cake. First and foremost, be sure to read through this post to get lots of tips for successfully decorating cute cakes. The instructions below mostly focus on how to create the shape of the truck, but the tips in that post are just as important! I decided to make Little Blue just a day or two before Owen’s party, so it was pretty last minute. I was planning to do a 2-dimensional cake in the shape of Little Blue as he appears on the cover of the book. 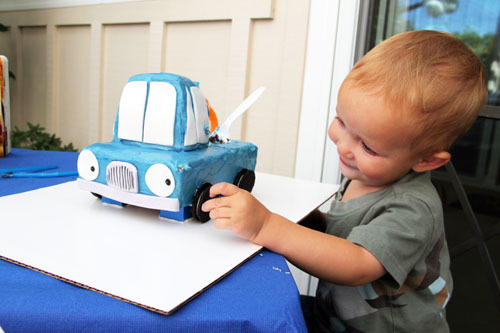 While the cake was cooling, Anna found a 3-dimensional truck cake in our favorite book Cakes for Kids and plans changed! 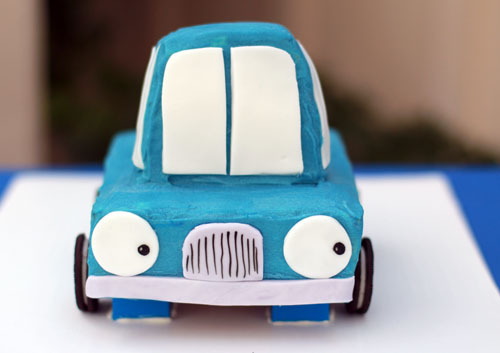 In Cakes for Kids, the truck cake utilizes loaf pans to create the shape, but since I had already baked a standard square cake for my 2-dimensional version, I went with my own design. It actually worked really well, so here’s what I did! 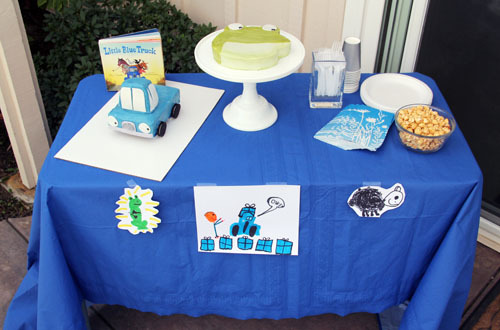 Find something to use as a “lift” for the cake – I used four blue duplo legos (I should have used white or black). 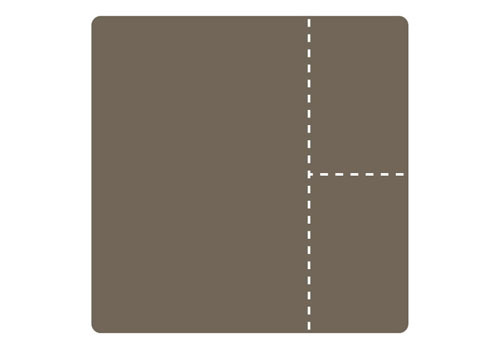 Cut a piece of cardboard that is just a smidge smaller than the largest piece of cake. On your cake board (the final board the cake will be displayed on), line up the legos (or whatever you’re using as a lift) underneath the cardboard cutout so that the legos are near the edges and placed where the wheels on the truck would go. Set the cardboard cutout aside, then secure the legos to the cake board using frosting. Freeze so frosting gets hard and legos stay in place. Put a dab of frosting on the cardboard cutout, then place the largest piece of cake on the cutout, lining it up so you can’t see the cardboard. Frost cake with crumb coat then freeze. Place one of the smaller pieces on top of the frosted cake, where the cab of the truck would be, making sure to use frosting to attach it to the cake below. Spread a layer of frosting on top of the small piece you just placed, then add the second small piece on top. Shape the two small pieces using a knife so it’s narrower at the top. Apply crumb coat of frosting and freeze. Frost cake with the pretty layer of frosting. 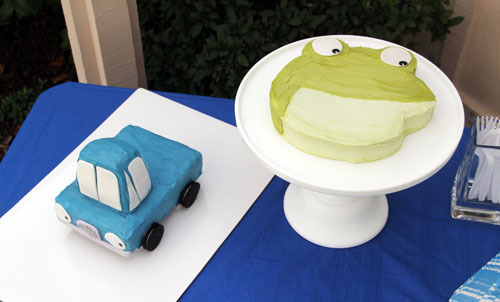 Use white rolled fondant to make the windows, bumper, headlights, license plate and grate. I added a smidge of black food coloring for the bumper and grate and a smidge of yellow and orange food coloring for the license plate. Windows and headlights stayed pure white. I used a black edible pen to draw in the eyes on the headlights and lines on the grate. To get the right size and shape for the windows/etc, I held up a piece of cardstock to the cake, estimated the size for each piece, then drew out the pieces and cut them out of the cardstock. I adjusted the templates where necessary then traced the shapes on the fondant with a knife, then cut the pieces out. Be sure to roll the fondant out quite thin or it will look too bulky on the cake (some of my windows were a little thick!). Place truck on top of legos on the final cake board, securing with frosting. Dab a bit of frosting on the edge of an Oreo cookie then stick to the sides of the cake, covering up the legos from the side, for wheels. If a little frosting squishes out around the edge of the Oreo, use a toothpick to clean it up. If I had planned ahead a bit more, I could have filled the back of the truck with animals, but I didn’t, so Little Blue had a light load that day! 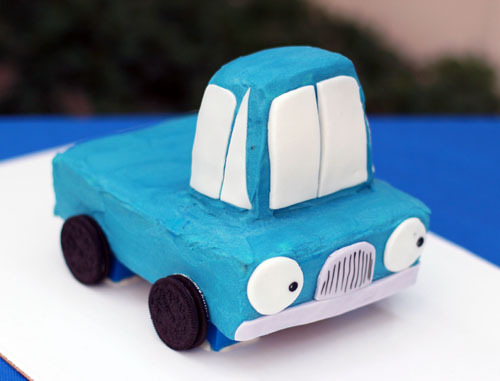 There are some fancier Little Blue Truck cakes out there that are sooooo cute (you have to check out this one – thanks for the link, Hillary!). But my simpler version worked just fine and Owen was ecstatic about his cake, crying out “Little Blue Truck!” every time he saw it. Plus, it is a pretty generic truck so you could make whatever color truck you want! 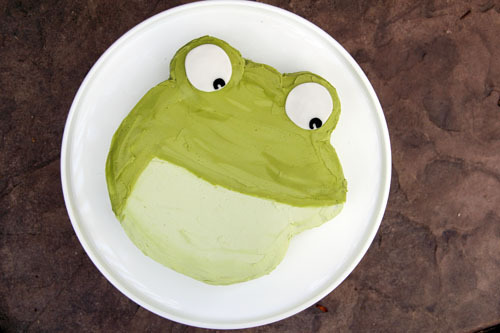 A quick note on the big green toad cake: I simply cooked an 8-inch round cake and then cut a few pieces out around the edges to make a shape of the toad’s head, with fondant for eyes. Super simple! My various birthday cake links if you’re interested! Click here for tons of tips for decorating birthday cakes, as well as the buttercream and chocolate cake recipes that I always use and love. My first birthday cake post on this blog that shows just how far I’ve come and proves anyone can make cute cakes! I can’t get over the cuteness of that cake! Makes me smile from ear to ear! So, so awesome! Looks like one happy little guy! Both are adorable – the cakes and the little guy. What a perfect little boy’s birthday cake! Wish I still had a little one just so I could make this cake. Great job, that looks amazing! Happy birthday Owen! You did such an awesome job! I was wondering how you assembled/cut the cake. Great tips. And Owen is just too cute. Happy birthday, little guy! Hi! That cake is just awesome!! I’m so glad you gave us your website name so that we can check it out. This is great!